Chakras are energetic points, or “wheels” in Sanskrit, that run from the base the spine up through crown of the head. These points are located in the subtle body and allow for prana, the life force or energy, to run through the primary energy channel through the spine. 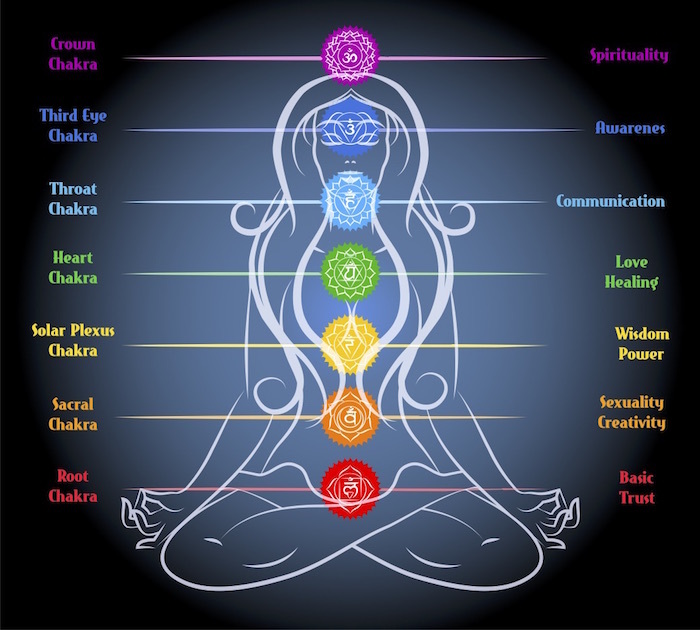 Each chakra is located at a specific area of the body and corresponds to emotional issues that live in our bodies at these different centers. As you move up from the first chakra, related to core issues of living in the physical world like safety and security, you start to encounter issues that move more inward and have to do with our innermost selves. Being able to holistically understand your health and what might be driving some of the physical experiences can be therapeutic, liberating, and a closer step to healing. Below is an introduction to the seven chakras, including where each is located, relevant anatomy, corresponding emotional subject matter, and related yoga poses that can help you work through and strengthen the particular issues associated with the chakra. Ultimately, it’s empowering to remind ourselves that we are in control of our bodies and and our experiences and that it is a powerful thing to connect the mind, body, and spirit in pursuit of a healthy and fulfilling life. The root chakra is located at the base of the spine and is represented by the element of earth and the color red. The relevant anatomy includes the legs and feet, eliminatory organs, the suprarenal gland, and immune system. The first chakra is related to family, group safety and security, ability to provide, social and family rules. Related yoga poses include standing poses that help you root down strongly and lift up (think Warrior 1, Warrior 2, Triangle poses). The sacral chakra is located, as the name suggests, at the sacrum, and includes the lower back, hips, sexual organs, pelvis, and bladder. It is represented by the element of water and the color orange. The second chakra is related to sexuality, physical desire, creativity, work and money, ethics in relationships. Related yoga poses include hip openers (think Pigeon, Bound Angle, Firelog poses) and forward bends (think Seated Forward Fold, Head-to-Knee Forward Bend). The solar plexus chakra is located in the upper abdomen, middle back, liver, gallbladder, kidneys, and pancreas, and is represented by the element of fire and the color yellow. The third chakra is related to ego, personality, self-esteem, personal honor, and the responsibility for decision making. Related yoga poses include twisting poses (think Revolved Side Angle, Half Lord of the Fishes, Revolved Chair). The heart chakra is located at the heart and circulatory system, upper back, chest and lungs, shoulders, arms, and hands. It is represented by the element of air and the color green. The fourth chakra is related to love, forgiveness, and compassion. Related yoga poses include backbends where your chest is in a vulnerable position (think Bridge, Wheel, Camel poses). The throat chakra is located at the throat, thyroid, jaw, neck, and mouth area and is represented by the element of ether and the color blue. It is related to issues revolving around communication, self-expression, will, and speaking one’s truth. Related yoga poses include Shoulderstand, Fish, and Plough pose. The third eye chakra is located in the middle of the skull, in the forehead between the eyes or eyebrows. It is related to the element of subtle ether and the color indigo and is related to issues around intuition, imagination, insight, and wisdom. Try Child’s Pose to connect to this chakra. The crown chakra is located at the top of the head, skin, and muscular and skeletal systems and is related to the color of violet or white. The seventh chakra is related to spirituality, connection to a higher power, and ability to have faith in life. The related yoga pose is headstand. To learn more about chakras and self-healing, check out Dr. Carolyn Myss’ Anatomy of the Spirit.